Located near the northern most point in Kentucky, we are now heading into our tenth year. If you are interested in metal detecting, relic hunting, bottle collecting, or any form of treasure hunting, check us out. Our club meets on the last Monday of each month, where we hold discussions pertaining to our hobby, and share ideas and stories. We also hold a find of the month competition, and a find of the year contest in December with prizes awarded. 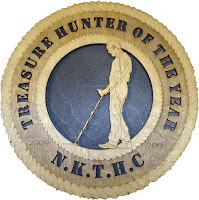 Our group is made up of many fine folks with lots of experience in the hobby of metal detecting who are willing to share ideas and experiences with other detectorists, new comers and veterans alike. Drop in and join us at one of our monthly meetings. Feel free to drop us an email with any questions.